Sad day today. Not because of the funeral of a British Prime Minister, after all death is something we can all be certain of. I am saddened at the sight of British people behaving in a disgusting and sickening way. It is one thing to attend a funeral and turn your back on the coffin as it passes. 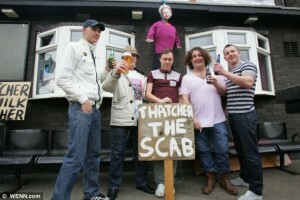 It is another matter to have an effigy hanging by the neck outside of a public house whilst the funeral takes place. The protesters mouth the words of anti capitalism, whilst the owners of the bar rake in the cash, fruits of a hate campaign orchestrated on Facebook. Many of these people were not even born during the Thatcher years, they will not remember that more coal mines were closed by the former labour Prime Minister Sir Harold Wilson. They will not know that employment actually increased under the Thatcher premiership and that British industry had been long in decline before she arrived. The three day week, the power cuts, bodies abandoned in the morgue and rubbish piled high on the streets because of strikes. Baroness Thatcher inherited a country on the brink of bankruptcy, a Britain that had become virtually ungovernable. We are told that the party will continue with the burning of a coffin and fireworks. I hope none of my Spanish friends will see this. They are already familiar with the drunken and abusive behaviour of British revellers in the tourist resorts. 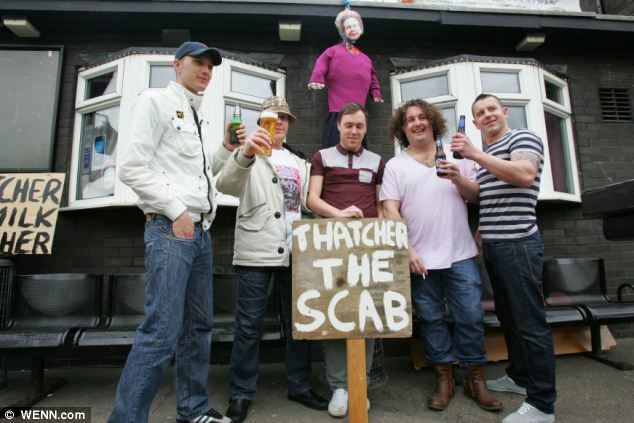 These images will only go to reinforce a negative stereotype of what it means to be British.